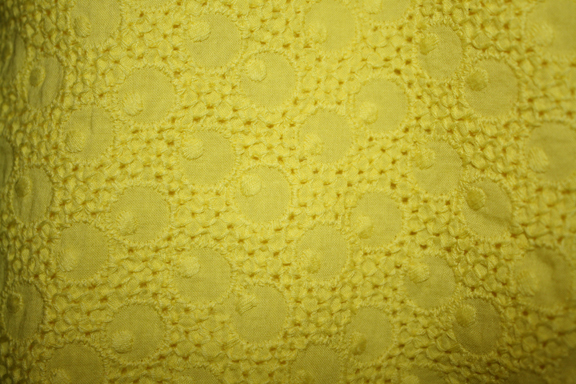 Swap #13 is a notice-me Bright Yellow Textured Cotton Skirt from Express. It's got a zipper closure, full cotton lining, and a beautiful A-line silhouette that just skims over your hips. -It is missing the self fabric belt that came with it, and this red belt is NOT included--but it goes to show that it can accomodate a plethora of skinny belts you may already own. If Interested in this swap, please read the How-It-Works section located with a simple click on the right-hand column of this blog. Study up on my Wish-List as well, so you know just what sways my opinion in terms of swapping! But feel free to offer up your own ideas for swaps as well-I'm open to almost anything. Don't have a swap-worthy item, but still want the skirt? Ok, no problem-its $6.00 + cost of shipping. If you have any questions, please ask--once item is swapped I do not allow tradebacks. The Swap will end on August 13th, 2010 at 11:59pm (NYC time). Please have your proposals emailed to me before then. that yellow is really popping!